In 1969, a group of farmers from the Manor and Pflugerville area was searching for a water supply for their families and livestock. Since then, Manville has grown into a much larger system with approximately 8,500 retail and wholesale customers and a staff of 24 employees. 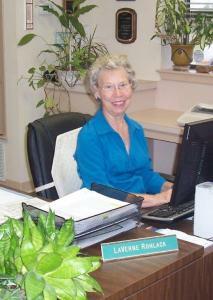 LaVerne has been a vital part of the organization, as she was one of Manville’s first employees. With her youngest son, (Thomas) in first grade, daughter, (Jana) in 8th grade and oldest son, (Ernie) a freshman in high school, LaVerne was working as a substitute teacher at the Coupland school. Having been on the Manville water system for several months, she mentioned to her co-worker that she had only received one water bill. At that point, someone suggested that she apply for a job at Manville since it appeared they needed office help. She did and here she is 39 years later. She has worn many hats over the years and currently serves as Assistant Manager and Director of Business Services. LaVerne began working for the company in October, 1974 and while the location is on the same city block as it sits today in Coupland, Texas, many changes have occurred over the years. When she first reported for duty, there were approximately 500 customers from the Pflugerville and Manor areas and the water lines were being expanded to include Pfluger-Berkman Road. LaVerne happily typed every customer water bill on a manual typewriter and the water meters were being read by the General Manager, Jim Brady. When the bill count reached around 800, she reports being very excited to acquire an “automatic” addressing machine. Or, semi-automatic, as the machine required her to make a metal address plate for each customer and then, manually stamp the imprint of each customer’s address on their bill. It is amazing how technology has evolved, but the job still got done with efficiency back in the day. Early in her career, LaVerne obtained her Class C Water License through the State of Texas and has maintained it through continuing education. In the early years, Manville purchased water from the City of Austin while drilling a few wells of their own. One of the first wells was drilled on what is today the Dell Computer Campus in Round Rock. While many wells have been added and a few retired, this well is still in operation on the Dell Campus. It is at this site that LaVerne has some of her fondest memories. Even then, water was scarce and the water well pumps did not have automatic shut off valves, thus having the potential to burn up if the well went low. LaVerne recalls she and Ernest spending many weekends sitting at the well sites to ensure the pumps were working properly. If air presented itself, they would quickly turn off the pump to prevent damages. While this job was monitored by outside help during the week, LaVerne did not mind going the extra step to cover it on the weekends! LaVerne is being honored for her years of service with an Open House to be held at St. Peter’s Church in Coupland on October 30, 2014 from 2:00 P.M. to 4:00 P.M. She has served the company well and is a knowledgeable resource, knowing the location of most waterlines throughout the span of the water system which covers approximately 400 miles. While the corporation will never be the same without her daily presence in the office, it is definitely a better place because of her hard work and dedication.